Notes on a Funeral…..Never mess with Frank Sinatra!!! Last Tuesday afternoon I left work early and made the trek up I-45 North to Conroe, Texas for a memorial service honoring the late, great, Joanna Allen. She was a long time friend of the family’s and actually spent her final 6 months living with my mother, Wanda. She was 88 years old and had a good life. Her funeral was typical enough. A scattering of family and friends dotting the velveteen covered pews of the one room chapel. 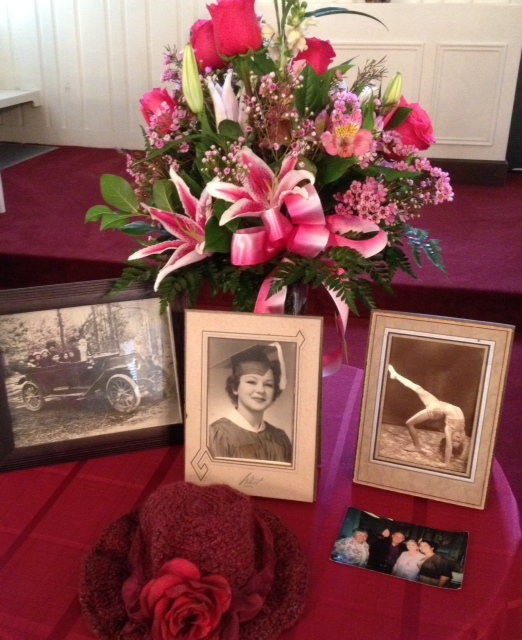 Memorial flowers and pictures from her life were displayed on a small table at the front of the church for everyone to inspect……A gymnast? Huh! Who knew??? The preacher man, suggested to the family by the funeral home, did his best to uplift and console the congregation. He quoted scriptures and spoke from the notes he was given about her life. He played LeAnn Rimes “Amazing Grace” over the pa system and I couldn’t help but hear the overtones of my cousin Dayna’s voice ringing in those same rafters singing for my own father’s funeral. In honor of Miss Jody’s love of big band music, the preacher man played Tony Bennett and Old Blue Eyes. He had never personally met Miss Jody but the stories he heard inspired him to close the service with a song that he took the liberty to rewrite the lyrics to. Frank Sinatra’s “I DID IT MY WAY”. He transform it into his own version of ” I DID IT MY LORD’S WAY” and he proceeded to sing it in a southern gospel style for the congregation in honor of Miss Jody. Bless his heart…..and mine! When the service was over, many people came to “pat” my mother’s hand and thank her for taking such good care of Miss Jody in her final days. She graciously smiled and “patted” them all right back. Southern etiquette at it’s finest. “My pleasure…of course…she was a dear friend…a part of the family…. I thought Wanda was doing pretty good …..till we got to the car to go to the reception at a local Mexican Restaurant given by the family. She turned to me and said, “I am sooo mad it Miss Jody. I just decided that right now. I am MAD! Now, Wanda Glyn is not one to get real riled up so I knew something was a miss. I turned and put my arm on her tiny shoulder and said, “Honey…It’s okay. It’s only natural to be a little mad. It’s part of the grieving process”. I was trying to make her feel better… Hell, I even patted her hand just like everybody else had that day but she was not having it! She said, “No, I’m mad! The doctor’s said Jody was fine and that they could manage all her conditions. She just made up her mind she was gonna die…AND SHE DID IT! And THAT makes me mad!!! She didn’t do things “the Lord’s way”…she did things HER way, exactly what she wanted to, when she wanted to! “Hmmm. I see.” I said, knowing I better not try and “PAT” this issue away. I sat in the car and thought for a moment. What the preacher man didn’t know was what a great spiritual teacher Miss Jody truly was in her life. She left this earth expressing the simplest and yet most powerful lesson ever. God is within each and every one of us. We all have the power to create our own reality every day. God gave us the ability to conceive a notion, hold it close to our heart, nurture it, then bring it manifest into this world. Miss Jody simply decided what she was going to do and she did it. She used the power of God within her. So I guess you could say the preacher man had it right. She did it the Lord’s way after all. What do YOU want to do Wanda? I asked. Well, I don’t wanna die!! !”, she said, still sounding rather pissed which made me giggle just a bit. I smiled at her like the cat that just ate the canary and said, “Then decide what it is you WANT to do next….And just go do it! I gave her a good, sound PAT on the back. “Let’s go eat some Mexican Food ….I hear Miss Jody’s buying!! !